With rising urban congestion and hours being lost while stuck in traffic, most people find driving to work a chore. That's also the main reason why prospective buyers are finding it difficult to ignore the convenience offered by an automatic transmission equipped car. Apart from letting you keep both hands on the steering wheel leading to better control, an automatic transmission also takes away the physical labour of manually engaging the clutch and gearbox numerous times. With recent improvements in technology, some automatics are as fuel-efficient as their manual counterparts and in fact even more. Maruti Suzuki, India's largest carmaker, is of the firm belief that automatic transmissions in cars are the future. In the past few years, quite a few car models have been launched with an Automated Manual Transmission (AMT). It is basically a manual gearbox, but a computer controls the clutch action. An AMT is usually sourced by car manufacturers from suppliers like Ricardo, ZF, GETRAG, WAPCO and a few others. However, majority of the carmakers in India are sourcing it from Magneti Marelli. Unlike a conventional automatic gearbox, manufacturers still haven't been able to tune the AMT to ensure smooth and jerk-less shifts. But the AMT's biggest advantage is that it is very cost-effective. It's no wonder that four cars on this list feature an AMT unit. The general notion of the car buyers in our country is that automatic cars are exorbitantly priced. However, that isn't always true, and we have compiled a list of five automatic transmission cars that won't require you to break the bank. Tata first introduced the Nano way back in 2009. At that time, it caught the world's attention with its unbelievably affordable promised price tag of Rs 1 lakh. 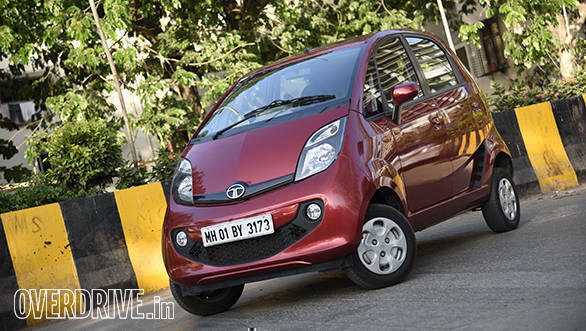 However, the Nano wasn't quite as successful as Tata Motors had hoped it would be. The company launched a thoroughly refreshed Tata Nano GenX in 2015. Apart from the cosmetic upgrades, the Nano was now being offered with a new AMT gearbox. With a price tag of Rs 2.87 lakh (ex-showroom, New Delhi), the Tata Nano GenX XMA is the most affordable automatic car in the world. The Tata Nano gets a fourth-generation Magneti Marelli AMT system with a hydraulic actuator and transmission control unit added to a 5-speed manual gearbox. The Nano AMT offers a 'creep' function which comes handy while driving in heavy traffic. In this mode, as one gets off the brake pedal, the clutch starts to engage and the car automatically starts inching ahead. To top it all, the gearbox even offers a Sports mode! With the 'S' button engaged, the gearbox doesn't upshift early and instead holds the gear right up to the redline. This feature comes in handy while executing overtaking manoeuvres. Even on the fuel-economy front, the Nano GenX AMT doesn't fail to impress. With a claimed fuel efficiency of 21.9 kilometres and a 24-litre fuel tank, it can easily cover around 500 kilometres on a full tank. This, however, is less than what the first-gen car used to offer - 25kmpl. The Tata Nano AMT is powered by a 624cc 2-cylinder petrol engine which makes 38.19PS and 51Nm of torque. It accelerates from o-100kmph in 32.2 seconds and can attain a top speed of 105kmph. Maruti Suzuki introduced the updated Alto K10 in October 2014. Compared with the previous model, it received an updated engine and interiors along with new convenience and safety features. At that time the company also introduced an AMT version of the Alto K10. In fact, with the Alto K10 AMT, Maruti Suzuki became the first manufacturer to introduce an entry-level car with an automatic gearbox. The Alto K10 is powered by a 998cc 3-cylinder petrol engine which makes 68PS and 90Nm of torque. The engine feels remarkably zippy and helps the car accelerate from 0-100kmph in 17.5 seconds. In fact, it pulls to its 6,500rpm limit much sooner than what one expects from an engine of this size. Another interesting bit is that Maruti Suzuki also claims a fuel efficiency of 24.07kmpl. The Maruti Suzuki Alto K10 AMT's transmission unit has been sourced from Magneti Marelli. In manual mode, the gearbox automatically downshifts to a lower gear while braking. However, under acceleration the driver will have to upshift. In the automatic mode, there's only drive, neutral and reverse modes to choose from. 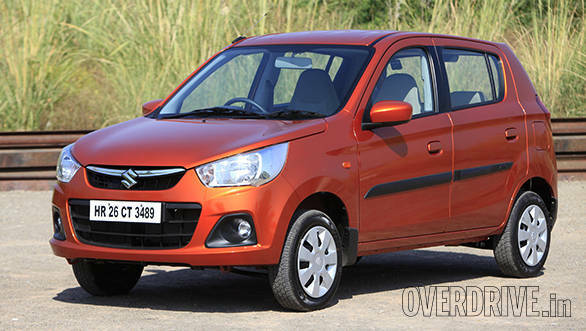 The Maruti Suzuki Alto K10 AMT is priced at Rs 4.06 lakh (ex-showroom, Delhi). 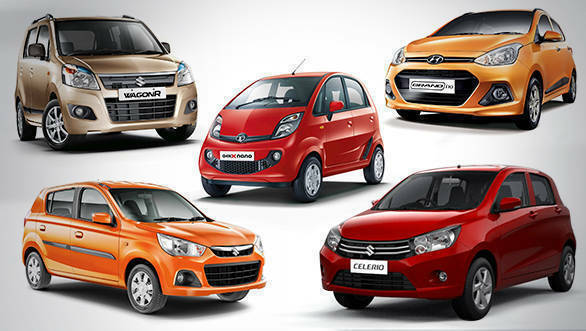 With respect to the small segment, Maruti Suzuki typically likes to offer cars at various price points. It is no different when it comes to its AMT model portfolio. For around Rs 45,000 more than the Alto K10 AMT, one can bring home the more spacious and bigger Maruti Celerio LXi AMT. With its launch at the Auto Expo 2014, Maruti Suzuki became the first carmaker to launch an AMT model in India. The Celerio AMT is powered by a 1.0-litre 3-cylinder K-Next engine. It delivers 68PS and 90Nm of torque. In automatic mode, the gearbox downshifts in a reasonably quick manner. However, the gearbox takes its own sweet time to upshift. 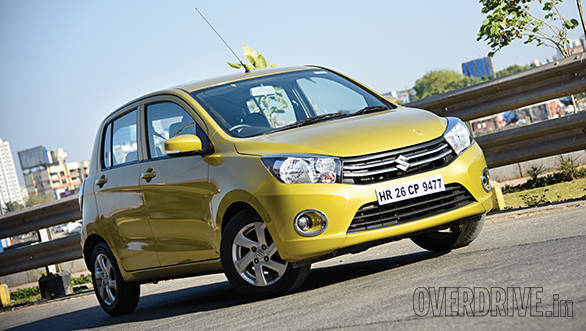 Maruti claims that the Celerio AMT delivers a fuel efficiency of 23.1 kmpl. During our tests, it delivered 15.5kmpl in the city and 21.6kmpl on the highway. That translates into an overall figure of 17kmpl which makes it more efficient than the Brio AT and Micra AT. The base Maruti Suzuki Celerio LXi costs Rs 4.51 lakh (ex-showroom, Delhi). The Wagon R has been on sale in India for over a decade now. And it continues to find new buyers month after month. In a bid to keep prospective buyers interested, Maruti Suzuki introduced the Wagon R AMT in November 2015. Compared to the regular version, the Maruti Suzuki Wagon R AMT only gets an Auto Gear Shift badge at the rear. Apart from this bit, there are no differences between the manual and automatic Wagon R versions. The Wagon R AMT is powered by the same 1.0-litre K-series petrol engine which delivers 69PS and 90Nm of torque. This particular engine also does duty on a host of other Maruti Suzuki models. Just like the Nano AMT and the K10 AMT, the Wagon R's 5-speed AMT has also been sourced from Magneti Marelli. 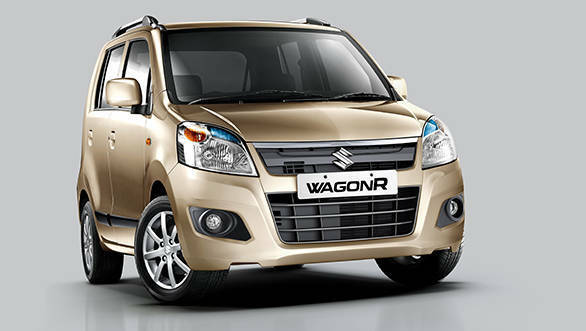 Maruti Suzuki claims that just like the manual version, the Wagon R AMT also delivers a fuel economy of 20.5kmpl. The Maruti Suzuki Wagon R AMT is priced at Rs 4.81 lakhs (ex-showroom, Delhi). 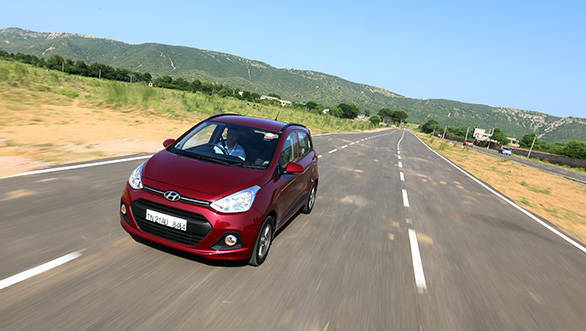 It's been over two years since Hyundai introduced the automatic variant of the Grand i10. It is powered by a 1.2-litre 4-cylinder petrol engine which is good for 83PS and 113Nm of torque. The engine is mated to a 4-speed automatic gearbox. The Hyundai Grand i10 AT is the only car in this list that doesn't come equipped with an AMT unit. The Hyundai Grand i10 Magna AT is priced at Rs 5.97 lakh (ex-showroom, Delhi).